Warm Winter Whites. . . I can't believe that it has taken me so long after Christmas to get back to my blog! I have missed blogging and visiting you!!! So, I am very happy to be back! Here in Utah we are getting the winter that we have needed for a long time. Last year we had no snow to speak of, so I am not complaining! How can you complain when it looks so pretty? Snow really is quite magical!! If you know me, then you know that I am a color girl. I love adding pops of color into our home. But after the riotous colors of Christmas I was ready to embrace some of the warm winter whites. 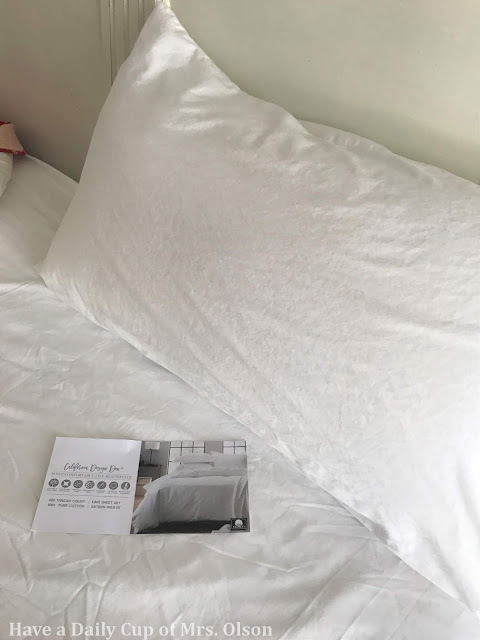 Recently I was contacted and asked if I would be willing to review a set of beautiful white sheets. 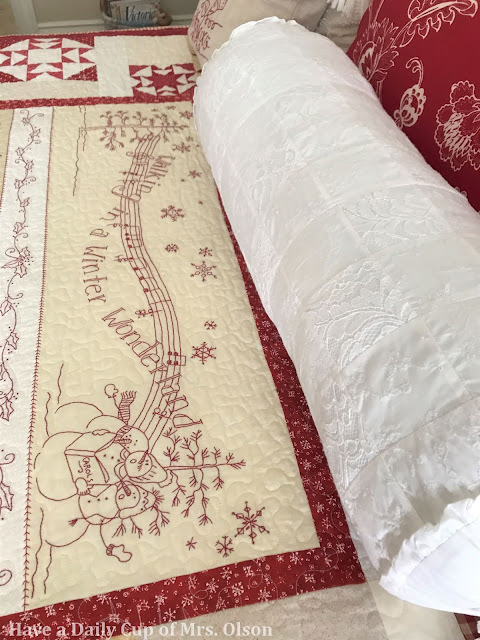 We will continue to have cold weather for awhile, so I've left the 'Winter Wonderland' quilt I made years ago on the bed. I have shared this quilt often, so let's focus on the embellishments. We've had the sheets on our bed for a week now. They are beautiful! Soft, and silky feeling, but not slippery. They are very high quality and I would recommend them to any of my family and friends. You can find them at California Design Den and this is a link to them on their Amazon page. They are nice sized with lots of fabric to be tucked in on the sides and bottom. 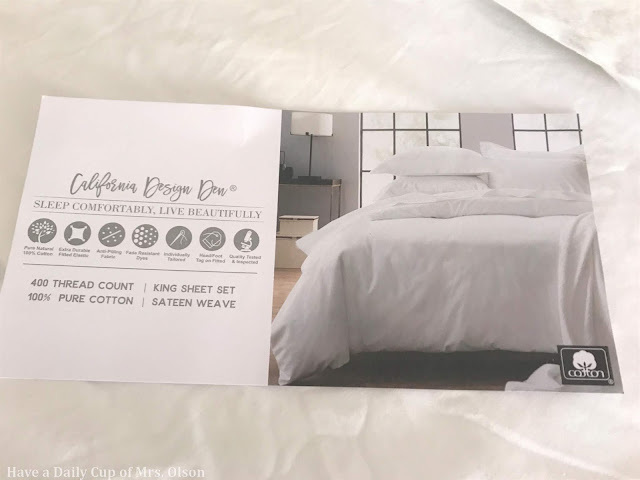 They are Sateen Weave, 400 thread count and 100% cotton. Normally I would have ironed the sheets, but because I have had such a lack of energy it just didn't happen. For Christmas I hung this sparkly wreath from the windmill blade. I felt it looked frosty and decided to leave it for a while longer. A few years ago I painted our cherry wood sleigh bed white with Annie Sloan chalk paint I still love it! 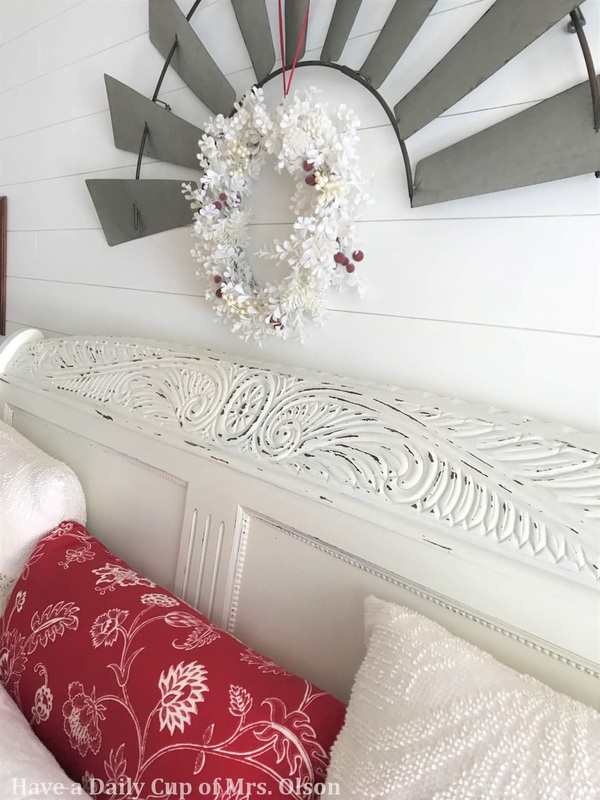 Hubby and I created the shiplap wall behind the bed a couple years ago. It really brightened up the room. I brought some of my white accent pillows out for warmth and coziness. This bolster was bought on clearance at Target. I bought this sweet ruched pillow at a shop that was about 15 minutes away from our home. Sadly it has closed. I have a darling white wool throw, but I couldn't find where I had put it, so out came the one from IKEA. 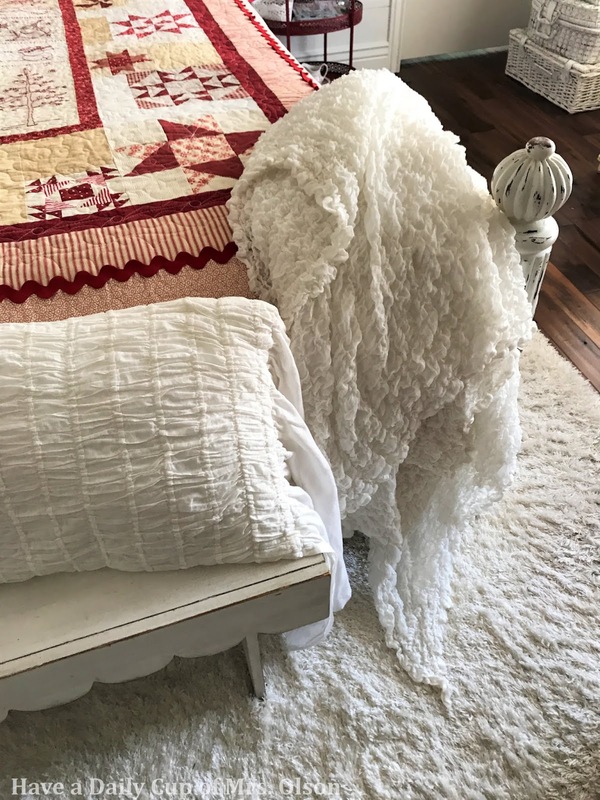 The white fur rug from Home Goods carries on the winter white theme. I know many of you are experiencing harsh winters. Stay safe and I hope this brings a little warmth and love into your hearts! And, just a little update on me: Today was the last day of 6 weeks of radiation and chemo. I am so happy!! Another blessing is that I was told I would lose my hair the 2nd or 3rd week. It didn't happen. I was totally prepared to lose it, so it was a nice surprise! Thanks for all the e-mails and sweet thoughts and prayers from so many of you!! Hi Jann!! !I am so glad to "hear" about you!Your quilt is adorable,great artwork!I also love the pretty pillows.Your snow pictures are stunning!Blessings!Best wishes,dear Jann! I'm so happy to see you back Jann! I will continue to pray for your healing. Hello Jann! It's great to hear from you. Blessings to you! If you have specific prayer needs please let us know. Jann, I'm so happy to see you back to blogging. Your quilt is so lovely! As are all your red and white touches! Pretty winter scenes. I like snow and am glad I live in a place where it snows. Yea, you are blogging! Your quilt is beautiful. 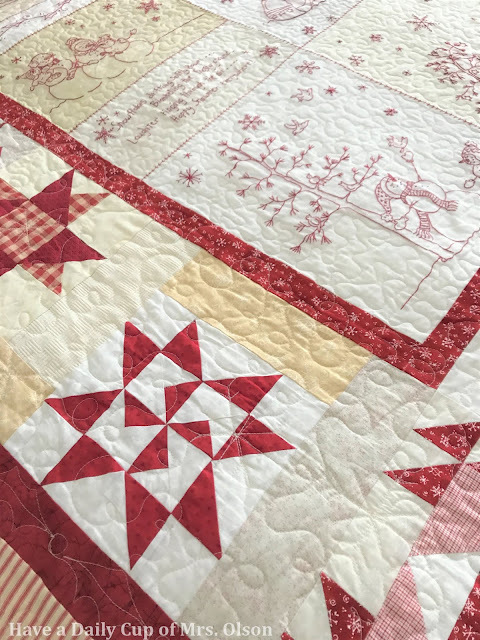 I made a red and white quilt last year and the first time I washed it the reds ran. I did put color catchers in the wash but they just didn't get it all. The fabrics were 'quilt shop' reds. Next time I make a red/white quilt I will be sure to prewash the fabric. 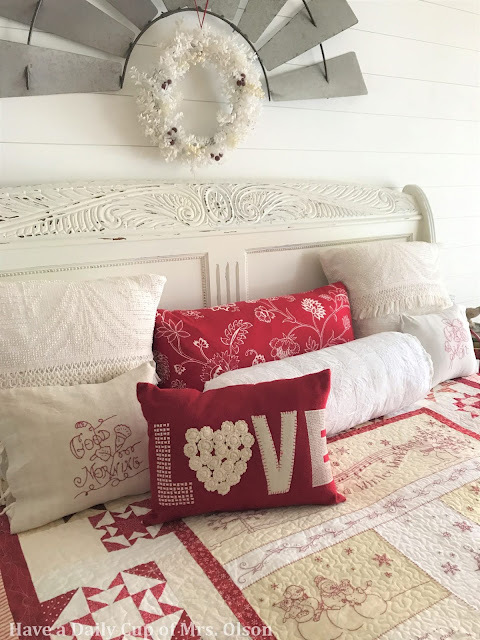 Love your wintry whites and the 'Love' pillow. It all looks fresh and cozy. Jann, it's so good to see you back. I've been thinking about you! I enjoyed looking at how pretty you decorated your bedroom. The quilt you made is just gorgeous. I am so glad that you are feeling a little better. Sending a lot of hugs your way. This may be the most welcome post I've seen in my in-box for a long while! Welcome back, my friend, and I'm so very glad your chemo and radiation are over! That had to be a long haul and I know you must be tremendously exhausted, so don't push too hard! But oh, I love your space. Like you, I leave some wintry things that come out at Christmas up for awhile and if that were my quilt, I would even hate taking it down in April, it's so pretty! Love the wreath, too. It's festive and so very pretty! Jan, Congrats on the end of treatment. I am so glad to hear from you. I have not seen red work embroidery before and it is so gorgeous. Lovely blanket. Love the wreath on the wall. Sylvia D.
Jann, one year ago this month I started 18 chemo treatments and then I did 10 radiations to my brain, 10 radiations to my throat and 30 to my chest (I had lung cancer) I did lose my hair. It just started growing back and they discovered a tumor on my liver. It is small cell cancer and it travels. I started radiation again yesterday but they promised me I wouldn't lose my hair this time. I only have to do 5 treatments this time. I will include you in my prayers. That blanket is just beautiful! I'm sorry but I don't know how to do a Google account so I have to be anonymous but my name is Patty. Nice hearing from you . Happy to read that you are finished with the treatments. You are in our prayers. Jann, I agree with you that snow is magical. Glad you finally got the winter you needed there. 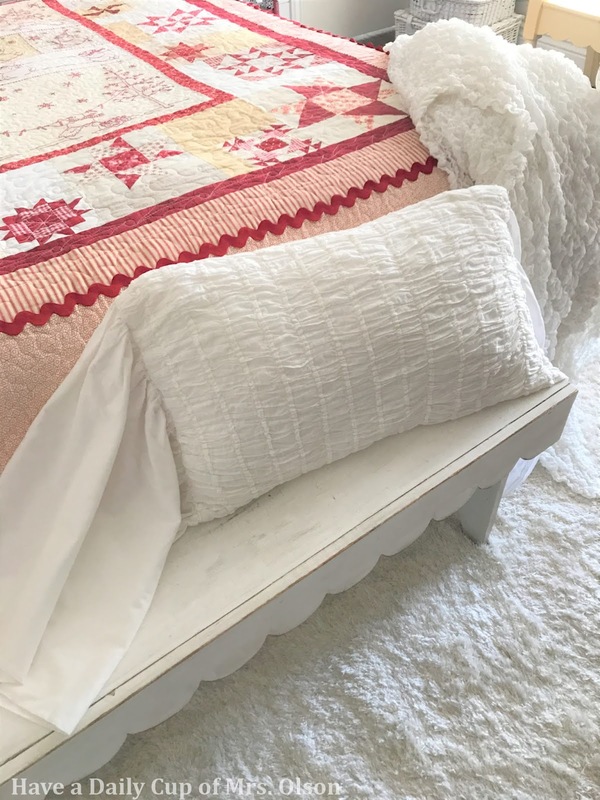 You bed set looks so very pretty, perfect for the weather. Enjoy your snow! Jann, congratulations on finishing your chemo and radiation!! Always in awe of your energy! Your bed is pretty but that quilt is gorgeous, yiur so darn talented. Welcome back, Jann! 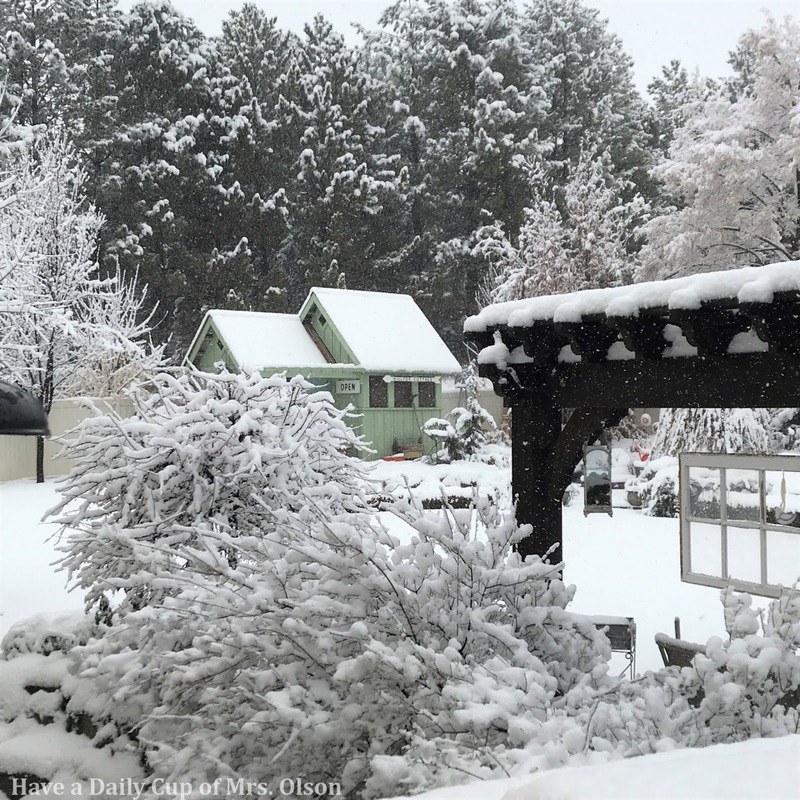 I do love me some snow and it is amazing how it transforms the landscape. So glad to hear that you have come to the end of your treatments and are doing well...and YAY about the hair! 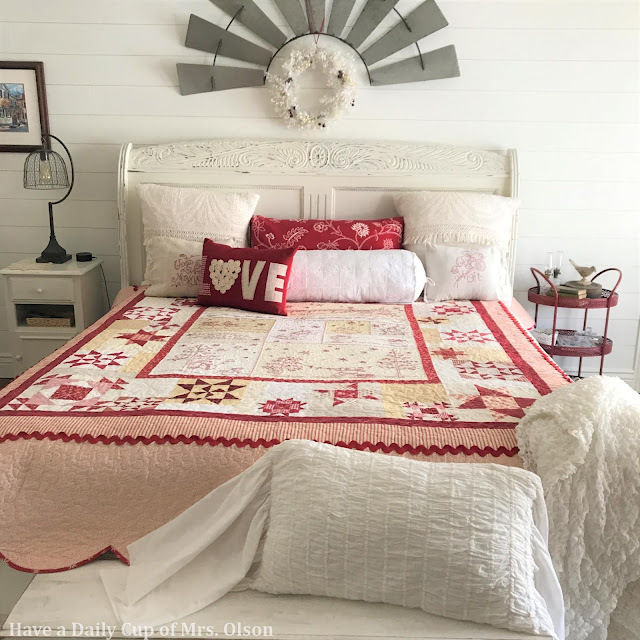 Your bedroom "winter whites" are so pretty and that quilt is absolutely GORGEOUS! Blessings to you! Love all the red and white in your bedroom. 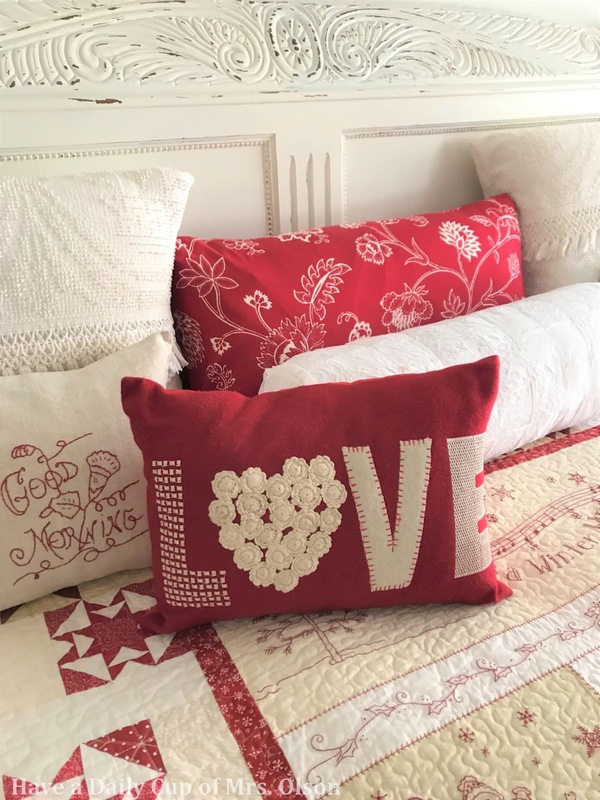 The wool "love" pillow is divine, I may have to try something similar (and that quilt!). Glad you are finished with the chemo and radiation, the radiation for my husband's tumor was a bit rough,never was able to finish a series of chemo (he had a reaction to it). He is still going strong and that was about 12 years ago! You are in my thoughts often. I am praying for you. You can contact me directly if you'd like specific prayer. You know the way. Your bed is beautiful. The redwork is impressive. I've thought of trying it myself, but since chemo, I have spent lots and lots of time knitting hats. I haven't even sewn since October! I have a few projects I need to finish, too. May the God of hope fill you with all joy and peace as you trust in Him, so that you may overflow with hope by the power of the Holy Spirit. Romans 15:13 paraphrased a bit. Jann, I was so happy to find you back at your blog today. I hope this last round of chemo and radiation will be all that's needed. You have been handling all this so amazingly well. Love your winter whites with just touches of color. Very serene looking. Wishing you all the best. Stay cozy!